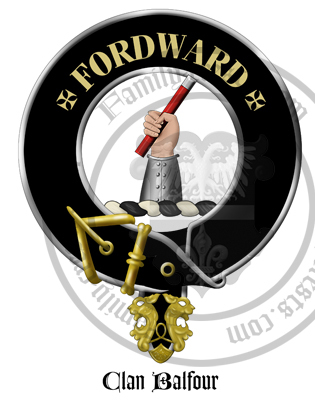 Clan Badge: A dexter arm in armour erect the hand holding a baton in bend gules, tipped argent. The Balfour lands lie in the parish of Markinch in Fife, on the Orr, a tributary of the river Leven, hence the development of the name from Bal-Orr. The earliest reliable record is in a charter by William the Lion, of 1196, where he expresses his favour of a Michael de Balfour. Sir Duncan de Balfour was a supporter of William Wallace, and fought and died in the Battle of Blackironside in 1298The Balfour lands passed to Sir Robert de Bethune in 1375 when John Balfour of Blafour died, leaving them to his only daughter, Bethune's wife. The Balfours did continue, however, through John Balfour's brother Adam, who married into the Macduff Earls of Fife, his descendents include the Balfours of Denmylne, Forret, Kinloch, and Torry.Sir Andrew Balfour, Baronet, and of the house of Denmylne founded what is now the Royal Scottish Botanical Gardens, and he was also the first president of the Royal College of Physicians in Scotland, he died in 1694.The Balfours of Burleigh became peers under the tilte of 'Lord Balfour of Burleigh' in 1606, but the fifth Lord of Burleigh was sentenced to death having killed the husband of his ex-lover. He managed to escape wearing the clothes of his sister. In 1713 he succeeded to his father's title, but two years later he forfeited it for his support of the Jacobites in the 1715 uprising. Alexander, sixth Lord Balfour of Burleigh was a Knight of the Thistle and Secretary of State for Scotland from 1895 to 1903, following the reversal of the title forfeiture in 1869.Arthur James balfour was Prime Minister from 1902 ti 1905, and became Earl of Balfour in May 1922. Arms: Argent, on a chevron sable, an otter’s head erased of the field. Crest: A dexter arm in armour erect the hand holding a baton in bend gules, tipped argent. Supporters: (Clan chief only)Two otters rampant proper.